(and why should you care)? Video recruitment refers to using video interviews at any point throughout your hiring process. Why does video matter in recruitment? Seismic shifts are happening in the world of work; leading organizations across the globe are already realizing the benefits of using video interviews throughout their hiring process. Video is no longer just a nice-to-have—it’s an essential part of your recruitment strategy. What is a video interview? It’s an interactive dialogue between at least two people that takes place remotely using video technology. Both the recruiter and candidate can participate in the interview from anywhere in the world using a desktop or mobile device with internet connection, a camera, and a microphone. The two main types are pre-recorded and live video interviews—throughout this guide, we’ll be focusing on pre-recorded video interviews. Video recruitment is on the rise not only due to technological advancements and workplace globalization, but also because personality rather than competence is now driving talent acquisition. In this ultimate guide, we’ll cover nearly everything you need to know about video recruitment, including the benefits, best practices, and practical tips to get started. How do video interviews work? While you can use pre-recorded video interviews at any stage of the recruitment process, most hiring teams see the greatest benefits for applicant screening. You can decide whether to incorporate video during this first phase. Consider including a video introduction of yourself and your company in the job ad. You can then invite candidates to submit a video introduction in response, or only ask for responses in the next step. Before sitting down to record your video questions, think carefully about what information you need from candidates to make smart recruitment decisions. What qualities are you looking for in candidates? What types of personalities fit your work culture? Less is more when it comes to video interviews—it’s good practice to ask three to five questions. Recording video questions should only take about five minutes or less, and you can send the same questions to all candidates. Both you and the candidates can re-record your video as many times as needed. Instruct candidates on how long their answers should be and provide any other specific guidelines. While it depends on the total number of questions you ask, most recruiters find the optimal length for one video answer to be within two minutes. Since there’s no need to coordinate schedules with candidates or your team, it’s easy for both recruiters and hiring managers to see all the candidates on their own time. Now that you and your hiring team have reviewed all the video answers, you have a clear idea of what candidates you do—and don’t—want to move forward with. Invite only the top candidates to in-person interviews. To learn how to develop lean and efficient recruitment practices, check out our Modern Recruitment Handbook. As the name suggests, these are the most common type of pre-recorded video interviews. They’re the perfect option for busy recruiters who have more than 10 candidates for a position. How do they work in everyday recruiting? Video interviews ultimately help you save time during the screening process. If you have a large candidate pool, it’s good practice to interview about one third of candidates. But you can invite everyone to submit video responses if your candidate pool is a lot smaller. Public interviews essentially replace job ads and are especially used in large recruiting campaigns. You can publish the video link on your career page, career portal, or on social media, and invite all interested candidates to apply. You can introduce the position in one video, then ask specific questions in a second one that requires an answer from candidates. After going through the video responses, you then pick the best candidates for an in-person interview. Using public video interviews is a great way to attract millennial candidates. It’s also a smart option if your company is active on social media since you’ll already have a large pool of potential candidates through your following. Embedded video interviews are similar to public video interviews in that anyone can apply to them. The difference is that they’re embedded to another page—you can embed a video interview on your job ad form through your ATS, or use it as an open application. You can only create one video interview question, and candidates can provide one video answer, as well as their email address and LinkedIn profile. When all the CVs flooding in look exactly same, you might feel like you’re making hiring decisions with a coin toss. Video interviews, however, give you a clear picture of the people behind the resume. Only invite your top candidates to in-person interviews and gain peace of mind knowing you hired the right person. Using video in your recruitment helps you make order out of chaos. Manage all candidates in one place, revisit replies, and make notes and ratings that are all visible to the whole recruiting team. Video recruitment removes geographical constraints, cuts down on tedious admin work, and makes recruiters’ lives a lot easier. Using video interviews results in about 50% of time savings in your screening and interviewing process. Interviewing fewer people face to face means significant cost savings. If you save two hours per candidate with video interviews when screening 10,000 hires annually, that's 20,000 hours saved per year—and roughly €2M saved annually! Using video interviews allows you to involve more people in the hiring process without the hassle of coordinating schedules. By sharing candidates with more people in your organization and building a transparent hiring process, you increase trust between recruiters and hiring managers, and reduce unconscious bias. A bad reputation will keep the best candidates from applying to your company. Using modern recruiting technology that provides a great candidate experience, however, will help candidates see your company in a positive light, and thus improve your employer branding. Candidates can better showcase their skills and personalities through video interviews. Give people a chance to be creative through video, and you might be surprised at how effectively they express themselves compared to CVs—which will make for much easier hiring decisions. Cutting down on recruitment admin not only benefits recruiters, but also candidates. When arranging an interview takes too long, candidates will get frustrated and might take an offer elsewhere. However, according to our 2019 candidate survey, 83% of respondents would recommend video interviews as a recruitment method from the candidate’s point of view. Hiring is a two-way street: Recruiters want to avoid hiring the wrong candidates, and candidates likewise want to avoid joining the wrong company. Using video in job ads to showcase your company culture will give candidates the information they need to decide whether they’re the right fit. Wondering how candidates feel about video interviews? Check out our 2019 Candidate Survey. People generally refer to pre-recorded video interviews as simply “video interviews,” which can lead to confusion about how they differ from live Skype interviews. Let’s clear this up: A live video interview is basically a video call in interview format. But a pre-recorded video interview involves the recruiter’s pre-recorded questions, and the candidate’s recorded answers. Video interviews replace traditional time-consuming screening methods like telephoning candidates, first-stage in-person interviews, and CV screening. They don’t replace all face-to-face interviews, but instead help you screen candidates more efficiently and avoid meeting unfit candidates in person. The odds that your candidates own a smartphone or a computer with a webcam—or at least have access to one—are high. But in the off chance that they don’t, they can simply get in touch with you to explain their situation. Even if one candidate isn’t able to record video answers, you’ll still reap the benefits of video recruitment in your business overall. 83% of candidates are overall satisfied with video interviews as a recruitment method, according to our 2019 candidate survey. The bigger question here is would you hire someone who isn’t motivated enough to answer a few short questions in a video? If they’re excited about the position and your company, they’ll answer the video interview. The rise of video recruitment hasn’t rendered humans irrelevant. On the contrary, video recruitment helps you do your job better by cutting down on admin work and simplifying your hiring process. Compared to traditional screening methods, video interviews bring humanity back to the hiring process by allowing you to see candidates as real people—not just names on a CV. It’s true that recruiters often use video interviews to screen candidates when mass-hiring for entry-level roles such as summer and graduate programs, where the age group is generally younger. But over 50% of candidates that reply to video interviews are over 30 years old—28% are over 40 years old, and 10% are over 50, years old according to our recruiter survey. Generalizing people based on their profession is dangerous. Every individual has a different educational, career, and personal background, and we can’t assume people's behaviour based on their current role. No matter their background or personality, candidates will submit video responses if they’re interested enough in the position—just as they would submit a traditional CV and cover letter. As mentioned above, video interviews especially help recruiters when high-volume hiring for junior roles. But they also help recruiters hire for middle management and more senior roles. It’s not unheard for CEOs to be video interviewed—it all depends on what is asked and who in the organization is the interviewer. A key reason to use video interviews is to make your recruitment process more efficient. The only time video interviewing would increase your workload is when you have fewer than 10 candidates for a position. Since video interviews help you choose which candidates to interview face to face, they won’t be useful if you plan on meeting them all in person anyway. Many recruiters think video interviewing isn’t for them—or candidates—since they’re introverted or uncomfortable being in front of the camera. But the truth is video interviews can make all recruiters’ lives easier—regardless of personality type or previous experience. Since you can record as many takes as you want, there’s no need to feel rushed or under pressure. Once they’ve tried it, 92% of recruiters said they’d continue using video interviews as part of their recruitment. Learn what recruiters think about video interviewing as a recruitment method in our 2019 Recruiter Survey. Before you press record, take a moment to look around the room. How’s the lighting? What’s in the background? Set the camera at eye level, and make sure the light doesn’t come from behind you. You’ll also want to dress accordingly to appear professional and give off the right impression. And stay away from any bright designs or patterns that can be distracting on camera. Recording interview questions should only take you a few minutes, but that doesn’t mean you need to rush the process. Take your time, look right at the camera, and speak loud and clear. Feel free to get creative—brainstorm some interesting questions beforehand, and consider giving a quick office tour or introducing your team in a welcome video. When you send out your interview questions, you set the tone for the candidates’ responses. If you want them to relax and be natural, don’t be overly stiff or serious in your video. Keep your questions simple and to the point so candidates will also stay on track. Video interviews help create a smooth candidate experience—as long as you make your expectations clear. Give candidates brief guidelines and explain what answer length you expect. You can do so either in the same video where you record your questions, or in a separate welcome video. Let’s say it louder for the people in the back: recruitment is a two-way street. Giving candidates a chance to ask questions not only shows you care about their concerns—it also helps you identify stand-out candidates. Asking insightful questions is an important way candidates can distinguish themselves from the competition. "RecRight did save me at least 50% of my time and helped me to be much more efficient with my job"
If the video interviewing platform isn’t easy to use for both recruiters and candidates, people simply won’t get on board. Before committing to a video interviewing platform, check out the user interface by taking a free trial or a product demo, and ensure it’s intuitive and simple for everyone involved. Do they offer customer support services? Not all video interview solutions come with support. But if you or your candidates ever need help with video interviews, you want to be sure you’ll get the support you need from a highly responsive team. Do they have a built-in commenting and rating system? When you can score and rate candidates within the video interviewing platform, communication within your team becomes a lot easier. No need to discuss over email, Slack, or carrier pigeon. You should be able to record video interview questions and watch candidate responses from the palm of their hand. And candidates will appreciate the ease with which they can submit their video responses over mobile. As a modern recruiter, you’re faced with the challenge to constantly renew yourself and stay ahead of the latest talent acquisition innovations. To recruit the right people for relevant roles in today’s evolving world of work, your hiring processes need to be lean, flexible, and efficient. 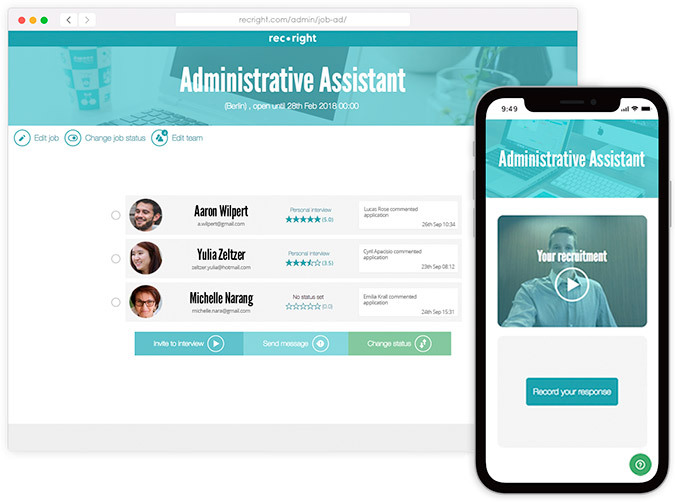 RecRight is a video recruitment platform that helps you and your hiring team speed up the entire recruitment process so you can focus less on admin, and more on people. While traditional screening methods are time-consuming and ineffective, using video in recruitment empowers you to find the right people faster. Ready to supercharge your recruiting? It’s easy to get started with RecRight—ask for a demo to learn more, or start a free trial today! I want a demo, contact me!